Furnishing and decorating your home is an exciting and liberating experience. Curating your space with care and consideration is so important for creating a home you love. There are so many decisions to be made and ways it could go wrong; you’re likely to be spending a lot of money and living with certain decisions for years to come, it’s important to get it right. Here are a few suggestions for furnishing a new home, the minimalist way. Before you do anything at all: establish a colour palette for your home - the rest of the decor will grow from that. Unless you want to live in a home with clashing, mismatched colours, a complimentary palette will help guide your decision making. The more you limit your palette, the more cohesive your home will appear. It makes it a whole lot easier to make decisions about colours, textures, and patterns. Even with a simple palette, over time you will find this will expand naturally as your home style develops. Stick with neutral colours for investment pieces, like the sofa, coffee table, wardrobe, and bed - and use accent pieces to add colour, such as artwork, throws, cushions, and plants. Not only will this maintain cohesion in your home, it’s much easier to play with colour when all you have to do is switch up the decor and not the furniture. Very early on we defined our colour palette: white and grey with wood and chrome elements. Slate-blue shades naturally started creeping into the living space and soft pinks and bamboo popped up in the bathroom. While it’s important to define a colour palette, letting your decor style naturally develop is the best way of creating a home you love. Or even at all. There are some things you will be told you simply must have and others you can completely forget about owning. Each home is different and the furniture you need might not be what everyone else has. The best thing to do when it comes to furnishing a home is to live with as little as you can get away with, at least at first. Live in your new space for a few months before making any big ticket purchases. 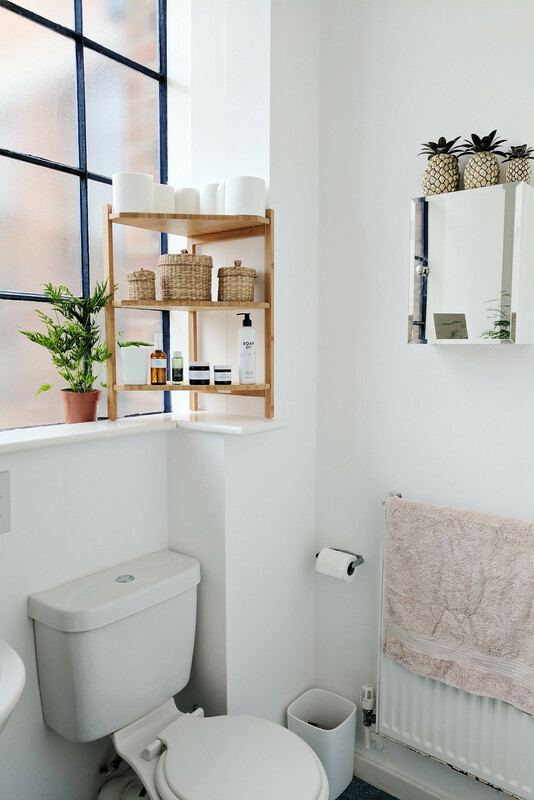 Big spaces and empty rooms can be quite daunting and you’ll be tempted, as everyone is, to fill it in as quickly as possible. Try to hold off, if you can. It’s best to get a little uncomfortable before buying, this will help you identify the pieces of furniture you simply cannot live without. How you think you’re going to use your space might not be how you actually end up using it. When you get uncomfortable without a piece of furniture that’s when you’ve identified it as a “must have” item and you can go ahead and start the hunt to find the perfect piece. If you’re not absolutely certain whether you need a permanent piece of furniture or something a little more temporary, buy secondhand. If you end up not using it or investing in something that suits its purpose more, you can donate it back to charity. Only buy “forever pieces” when you’re absolutely certain it serves the purpose you need it to. A bunch of our furniture is secondhand either purchased from charity shops or gifted from family. They add character to our apartment and compliment the modern pieces we own. 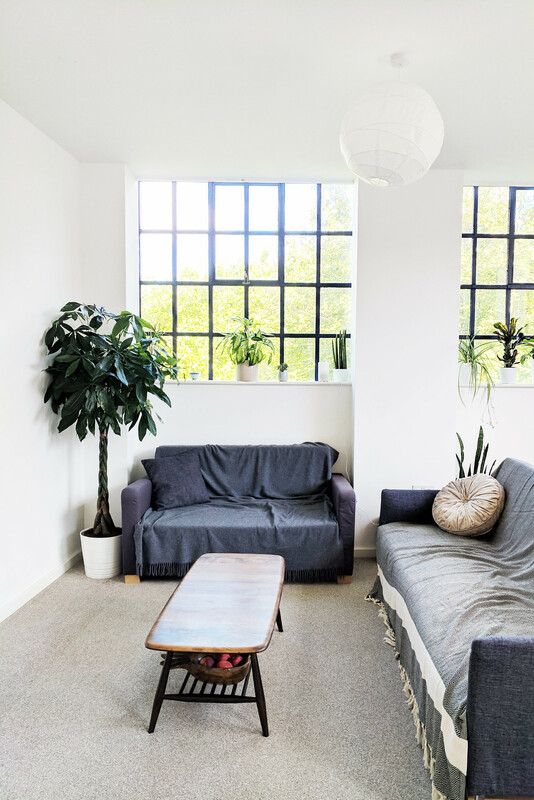 Having a few hand-me-downs, especially from family and friends, can really add to the feel of your home - so don't write-off owning pre-loved furniture or be in too much of a rush to get rid of it. The most obvious place isn’t always the best place for a piece of furniture to live. Where you think items are going to go isn’t always where they end up. Don’t be afraid to move things around, a lot. Often floor plans demonstrate how each room was intended to be lived in so you might be included to stick to those plans instead of moving things around and playing with the space. Moving things around enables you to plan your space with the furniture your already own and helps you envision what it would be like with any new pieces you want to add. 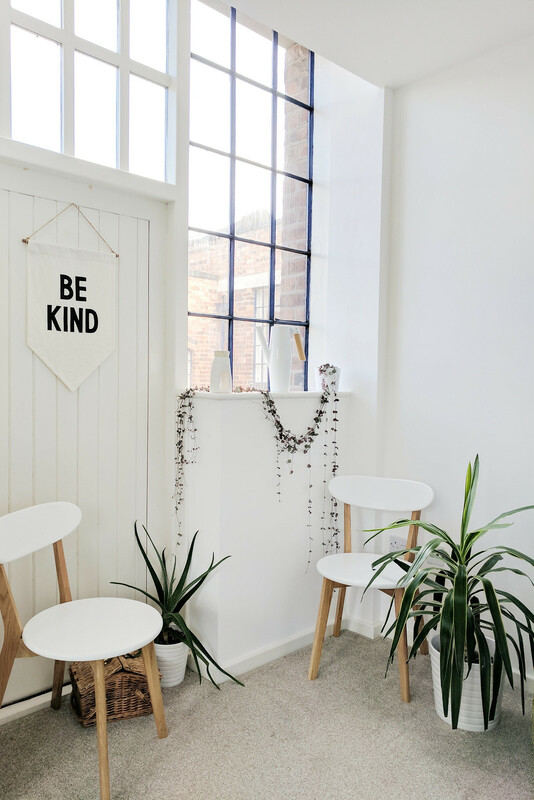 Consider what you want from your space, how you want it to serve you, whether you might want to change it in the future and how that will affect the choices you make when furnishing it. If you’re considering any big changes, plan out your space to help identify any problem areas in the decision-making - and always measure! The “master bedroom” in our apartment isn’t a bedroom at all. To the horror of the previous owners, we decided to make our bedroom in one of the smallest rooms in the apartment. There didn’t seem to be much point in dedicating such a huge space to a room we spend the least amount of time in; the choice has made for a much cosier and enjoyable bedroom. So don’t feel you have to use your space the way it was suggested or even intended to be used! Think and think again about items you’re considering buying and items you’re considering getting rid of. Shop around, consider your options, and define your budget; furnishing a home can be as expensive or as affordable as you make it. Consider buying new-but-secondhand, scout around in charity shops, look online, and browse websites. The more searching you do the more options you’ll have and less costly your mistakes might be. If it’s your first time furnishing a home the excitement can result in ill-advised decisions. It takes time for your personal home style to develop and rushing into purchases is a costly mistake to make. Make use of Pinterest, wish lists, and your phone; photograph and pin home decor ideas and furniture you find online and in shops. Interior design websites and magazines can make home decor look easy; if you’re considering a statement pink sofa or marble countertops, Pinterest will help show you how easy (or difficult) those things can be to style. Be careful you’re not seduced by perfect (show) homes and consider whether your dream furniture is suitable for the space you have. If you’ve inherited furniture you don’t particularly love, you might feel like you no longer need something or are ready to replace it with an upgrade; consider where else it could go and what other purpose it could serve in your home before letting it go. A few pieces of our furniture are real workhorses; the chest of drawers that previously housed our clothing has been repurposed as office storage. Although it's seen better days, a little TLC and it'll be beautiful again. It's always worth asking yourself whether an underused piece of furniture could be put to better work elsewhere, even if not for its intended purpose. Sometimes you don’t have time to wait and you find yourself stocking your home with IKEA basics. Furnishing a home with furniture you love is a slow process best done over time. It’s a good idea to invest in a couple of really nice pieces (if you can) as it will set the mood of your home. Investing in a sofa or coffee table can change the feel of a room and take attention away from the less than dreamy pieces. But when you’re just moving in, especially into an unfurnished space, that isn’t always an option. Instead of rushing into purchases you might regret, upgrade slowly. Make do with what you have, borrow if you can, and buy secondhand when possible. Think of practical solutions to problems; give your existing furniture a little TLC with some DIY projects. Find cheap solutions to temporary problems like refreshing the paint, replacing handles, and otherwise upgrading the appearance of your existing furnishings. These small upgrades can tie you over until you have some money in the pot to replace the furniture. Create a wishlist of dream pieces and prioritise which ones are next on the list to be upgraded. Upgrading slowly allows you the time you need to research and consider your options so you can find the more perfect fit for your space. 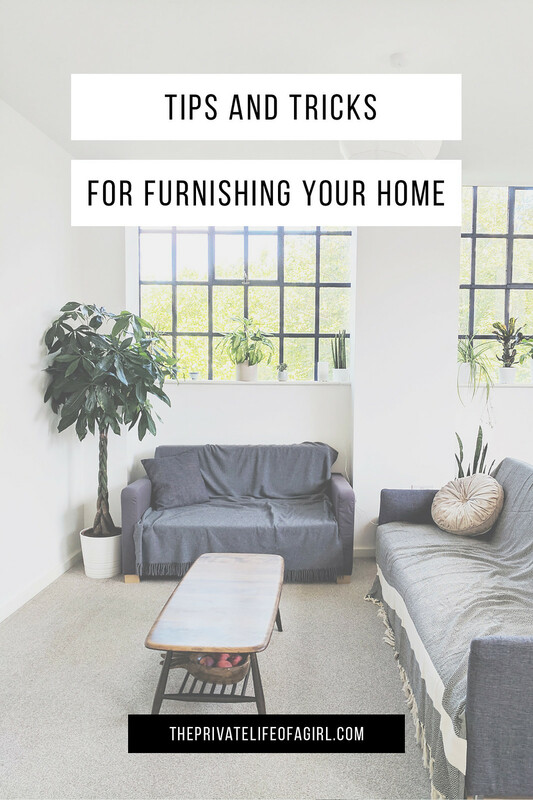 We started off with a lot of furniture from IKEA because it was the quickest and cheapest way for us to furnish our first, completely unfurnished, apartment. Upgrading furniture all in one go gets really expensive really fast; we always have one piece that’s next on our list to upgrade. We started with the biggest pieces first, like the dining table and chairs, bed frame, and coffee table, and we’re working our way to the smaller, less noticeable pieces.